Understand why your garage is floor damp and also how to investigate damp concrete. Also, find out how to coat and seal damp garage floors using an air gap membrane, damp proof membrane or vapour barrier. This project is packed with information about damp proofing for concrete floors and how you can treat your garage floor and then what floor coverings you can cover your garage floor with so that it will remain dry and not rot or damage anything you store in the garage. This project has been written with the help of Property Repair Systems, who are experts in treating damp, particularly regarding all types of garage floor and wall repair and coating. If you need any help with garage floors or walls, including dampness problems Property Repair Systems expert staff will give you completely free, no obligation advice on 01626 336180. The information you need may be in the project below. If not, we recommend that you call them. Why Your Garage Floor is Damp! Garage floors were not typically laid by the builder of your property to the same standards and guidelines as floors that are going to form part of the living space. As they are not going to be part of your inhabited area there is no need to go to the time and expense of ensuring that they are damp proofed to the same standards as internal floors would be. Similarly, the walls were not usually constructed to cater for a living space and therefore if you convert your garage into a living space, bear in mind you may have to deal with these short-comings. clear and brush an area of the garage floor so that it is totally free from any loose materials. Now cut a small square of plastic around 100mm x 100mm and, using plastic tape, tape it to the floor area on all four sides and leave it overnight. If there is moisture evident in the morning then this will confirm that the floor is damp. If the result sof the above test confirm the presence of damp then before you can lay any type of flooring you will need to seal the surface and also any floor to wall joints. Currently, moisture is evaporating into the existing, well ventilated, uninhabited garage and this will generally cause no issues because it is removed through ventilation in the space. However, when you turn it into a living space, the room will be insulated and the ventilation will be much reduced so you can heat it effectively. If you do not seal the surface of the floor, this moisture will be the cause of some serious issues when it condenses on cold surfaces causing mould to grow and due to this can also cause rot in timbers. If you decide to lay a wood floor it will absorb this moisture, swell, lift and eventually also rot. When damp proofing a concrete garage floor, a plastic dimpled membrane is required if the floor is going to be boarded (either with chipboard, plywood or similar) or if a concrete screed is going to be laid. 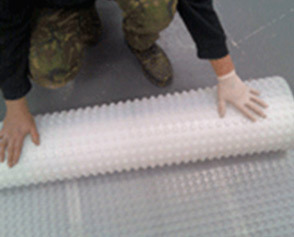 You might consider a slimline membrane which is ideal if you intend on laying carpet over your floor. This can be painted directly on to the surface of the floor after a little preparation. This will seal the concrete floor creating a moisture barrier preventing damp entering the garage. We suggest that you use a liquid product, such as Ultra Epoxy Seal supplied by Property Repair Systems. For your damp proofing to be effective the damp floor will need to be prepared correctly regardless of the product or technique that you choose to seal it with. There is a joint between the floor and the wall where the two meet. This is often quite rough and open to the elements and provides the point where much of the moisture can enter your garage. This joint needs to be opened up, cleaned and then filled with a waterproof material. This will then seal the joint between the wall and floor eliminating and potential future problems. A good solution to fill this joint is a Structural Epoxy Pouring Grout. The joint will need to be opened up to approximately 25mm x 25mm (1 inch x 1 inch) for this to be effective. Opening this joint can be done with a disc cutter (angle grinder) and a stone blade. You should wear safety goggles and a face mask for this job as it is very dusty indeed. Keep the garage door open while you are doing this. Having cut down 25mm or so into the floor, you will need a lump hammer and a 25mm cold chisel to bash out the concrete. Smooth the bottom of the small "trench" with the chisel so there is as little variation in the depth along the length as possible. Alternatively you can cut this joint out with a hammer and bolster chisel which is much harder work! Once the joint has been sealed, the floor can be coated. Whichever coating you choose, it must be laid up the wall far enough to join with the existing DPC. If you are using the Vapour Barrier Membrane, then this should be rolled out over the floor and turned up at the edged where the floor meets the walls. This should create a ‘tray’. 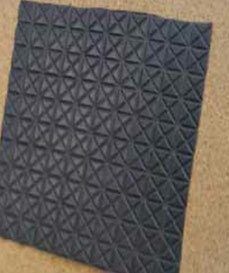 It is important that the up-turned edge of the membrane is high enough to rise above the chosen flooring. This will then protect the ends of the flooring from getting damp. The over lapping joints, where the rolls of membrane meet and the corners, should be sealed with double sided tape. The skirting will hide the turned up edges of the membrane, or the up-stands, as they are commonly referred to. The advantages of this system are. 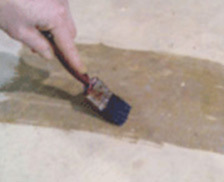 Alternatively, apply a liquid epoxy membrane to a clean, dry concrete floor. This can be applied with a brush or a roller and the amount required will depend on the absorption of the concrete and the roughness of the floor surface. Typically this will be between 2.5 and 7 Sq m per litre. There are advantages with this system, although it is typically a little more expensive. It raises the floor level only a few mm. There are a number of floor coverings that you can lay over a sealed garage floor. The choice of floor will have some impact of the method that you should use to seal the concrete floor. A floating floor: For example this could be chipboard layed on to battens. This will also require adequate ventilation and treatment to avoid rot and pests – This can also be layed over the affore mentioned membrane but also also a sealer such as ultra epoxy seal. A screeded floor: If you choose a screed floor (see how to lay a screed floor here) you will need a minimum of two inches (50mm) of screeded concrete. You can lay this over either a membrane or even a sand ‘blinded’ Ultra Epoxy Seal. Usually a garage floor is laid 100mm below the level of the house floor. This is a building regulations requirement. Raising the floor to the existing level of the house will allow you to insert some insulation which will help with the heating bills as a not inconsiderable amount of the heat from a house escapes through the floor. A directly bonded floor using timber or tiles: You can lay this over chipboard, directly on a membrane or directly on to blinded epoxy seal. For this, you will need to use a product such as epoxy flooring adhesive. Using this method of flooring can only be 100% successful if the finished surface is completely flat and every single part of the chipboard (or plywood) sub-base is flat against the coated concrete floor. If there are any dips or bumps, the floor will move slightly when it is walked on and the tiles or bonded timber joints may crack with the movement. When laying tiles or wood directly onto a floor of any kind a flexible adhesive should be used. For further information about planning your garage conversion please have a look at our project on converting a garage. If you need help and additional help with garage floors or walls and damp issues Property Repair Systems offer a free, no obligation advice service on 01626 336180.